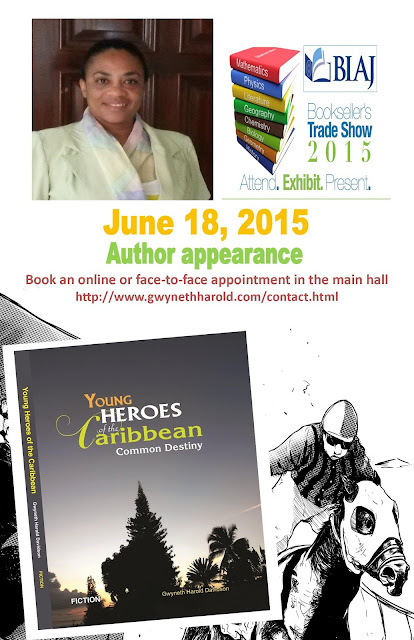 I welcome the 2015 staging of the Book Industry of Jamaica Trade Show in downtown Kingston, and expect that it will be an energetic day with publishers, distributors, librarians and educators exploring developments in the industry. I aim to provide engaging stories for YA readers, who we know are definitely not limited to young adults! My newest book Young Heroes of the Caribbean can be a good match to a YA catalogue or inventory, and bring in new readers to enjoy material from the Caribbean. The book is already connected to media tie-ins that invite the reader to be immersed into the story before turning a page. The current tie-ins include illustrations and audio drama that is useful for lovers of audio books. In addition, the audio materials will help to build confidence in young and/or reluctant readers. This is a family story that can find resonance anywhere on the globe. Conflict between former lovers, custody of a young child, vagaries of steady employment and the stability of a home of your own. What makes it uniquely Caribbean is the warm, sandy beach setting, the delicious local seafood, the history of thoroughbred horseracing that is deeply ingrained - and often overlooked - aspect of our culture. The history of enslavement that has shaped our culture is viewed in a heroic sense and how it developed respect for valour and the value community life. I look forward to building your confidence in this book and having mutually fruitful discussions.